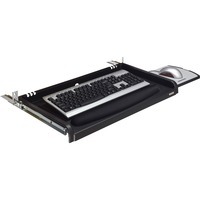 Keyboard drawer offers cushiony soft gel wrist rest for added comfort and Precise Optical Mousing Surface. Wrist gel rest has antimicrobial protection. Extra wide tray is easy to install and height adjustable. Steel ball bearings provide smooth movement. Keyboard drawer features cable management slots and a 16 12 track. Mousing surface can be used to the left or right of the keyboard. Keyboard drawer works in standard workstations.